I decided to get a job programming, and after around 100 interviews secured employment with The RUF Organisation in Haywards Heath programming Nixdorf Visible Record computers. However most of my efforts went into machines with paper tape. 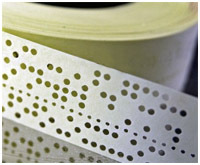 The initial readers used metal brushes to sense the holes in the tape which was unreliable due to bounce, dirt and wear. Later we added an optical reader which was much better. I was mostly involved in maintaining existing programs and experimented with writing new microcode for the test machines and wrote a cross assembler that ran on an external ICL 1900 bureau to produce code for the clients machines. One of my clients decided to get in an IBM System/3 and recruited me to convert their systems from paper tape to card.